I went to one of the most enlightening evenings of my life today; a presentation of the work of Reza, who was at the Frontline Club to discuss his book ‘War and Peace’. After having had an excellent Portfolio Review at the foto8 offices this afternoon, it topped off a pretty fabulous day. Reza’s work spans some of the most poignant moments of the 20th (and, indeed, the 21st) Century and is remarkable in both its breadth and quality; not surprising from a man whom National Geographic celebrated on film as one of the men in the world today capable of changing the way that lives are led. Of all his work, I find his images of children and the dignity and hope he portrays within their faces the most satisfying. Reza commented that within children he sees the possibility of change, and in some small way this is the same reason that I have taken many images of children throughout my own work around the world. I love their interest, fascination and the lack of social ‘fear’ that is often so ever-present within adults. Their minds are still free of restraint and open to the possibility of change, and you can see it their eyes. Reza’s work with AINA is to be admired and is a lesson for us all in raising awareness for those who cannot do it by themselves. He has changed people’s lives in a way that most individuals cannot ever hope to replicate. And he does this with intense modesty. He is truly one of the most inspirational characters I have ever met. When asked what advice he would give to aspiring photojournalists, Reza answered that one must be passionate, true and to ‘never sell your soul to the devil’. In all the successful people I have met, whatever their line of work, these qualities are present; passion above all. This message came through to me throughout my Portfolio Review as well, about ‘having heart and vision’, and is a real message for the future. It really has been a life-changing day! I have just taken one of the most important steps in my photographic 'journey' and had a professional portfolio review at the Foto8 offices in London. I had 2 reviews, the first by Nick Galvin (Archive Director, Magnum Photos) and Harry Hardie (Manager, HOST Gallery), and the second by Monica Allende (Picture Editor, Sunday Times Magazine) and Jon Levy (Director, Foto8). It was a very nervous step for me, as it was the first time that I have opened myself to serious criticism by those who deal with the best in the business. I chose 25 images and showed them as a 'lightbox' slide show. I chose the images to display a variety of projects and ideas that I had been working on. With hindsight, and an important note for the future, I should have displayed half of the portfolio as an exploration of ideas and half of it depicting a singular project, as all of the reviewers said that they would have liked to see how I deal with an idea within a series of images. 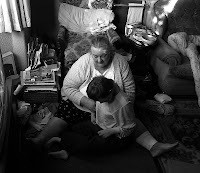 I had the greatest impact from the B&W images that I showed, especially the 'My Norfolk' series of images and the study of 'Mother and Child' (shown below) which both stemmed from the need to document what was around me and to try and give it meaning. All of the reviewers were enthusiastic and encouraging, especially Nick and Harry. Nick was kind enough to comment that I had a very keen 'eye' and obvious talent, and Harry likened my work to David Hurn and Tony Ray-Jones (and gave me some very useful references from both photographers to look at, especially David Hurn's 'On Being A Photographer' co-written with Bill Jay). This was high praise indeed, as I am a keen fan of both photographers. Jon Levy's comments were extremely valuable and gave great food for thought. Of note was his advice on finding a subject that is accessible, which can be worked on over a long period of time with relative ease. He also pointed out the need to put a 'stamp' on the work - to find something that is definitively 'me' and put something of that within the images. This complemented Harry Hardie's comment that a photographer should always have an idea as to what they want to capture - even 'accidents' are opportunities that are created by the photographer because he was looking for them in the first place. By having easy access to a place, it helps the photographer to continue to go back until he captures what it is he is searching for. All in all, the advice has given me some useful tips on editing my work and has given me an insight as to how I should conduct my practice in the future.